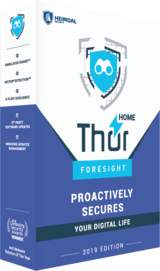 ✔ Thor Foresight Home - Advanced internet traffic scanning that blocks ransomware and malware before it gets to your PC. Can work side by side with any antivirus software. YOU’RE SAFE FROM COMPROMISED LINKS, MALVERTISING, RANSOMWARE AND OTHER THREATS. Detects threats at the DNS, HTTP, HTTPS layers, before they reach your device, and prevents data leakage and compromise. With a unique, proactive approach to security, DarkLayer Guard™blocks all incoming and outgoing communications to malicious servers, preventing APTs and other threats. REST ASSURED THAT YOUR CONFIDENTIAL DATA STAYS SAFE. While antivirus is a reactive solution that scans code to stop threats, our VectorN Detection™ will autonomously detect and prevent infections. Through VectorN Detection™, hidden malware in your system will be immediately detected and blocked before it can compromise your data. YOUR APPS ARE SAFE AND AUTOMATICALLY UPDATED. Through X-Ploit Resilience, available updates are automatically and silently updated. This way, you eliminate vulnerabilities before they’re exploited and infect your PC with malware. Did you know that keeping software updated closes 85% of security holes used in cyber attacks? OUR 100% DETECTION SCORE WILL KEEP YOUR SYSTEM SECURE FROM KNOWN THREATS. This lightweight, hassle-free solution combines the techniques known by both traditional and next-gen antivirus engines to provide unparalleled protection against online threats. It will stop ransomware, data leakage, viruses, APTs, exploits and other threats to your digital life. Does Thor Foresight work with antivirus software? Yes, Thor Foresight works seamlessly with any antivirus, including: Avast, AVG, Avira, Bitdefender, Esset, F-Secure, Kaspersky, McAfee, Malwarebytes, Norton, Trend Micro, Webroot, Windows Defender, and more. 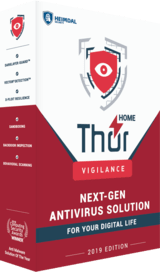 Thor Foresight provides an extra layer of security that you do not get from your antivirus, thus complementing its features with a proactive defense behavior. Can I get a refund if I'm not fully satisfied with the product? 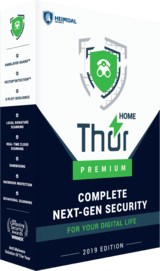 Although we're sure that Thor Home will be the security layer your computer needs, and that you'll be fully satisfied with your purchase, we do offer 30 days money-back guarantee. Who can I talk to if I have a question? It's super simple to contact one of the technicians in our Customer Support Department: just send an email to support@heimdalsecurity.com anytime, and we'll get back to you in 24h at most! On what operating systems does Thor Home work? Thor Home runs on PCs that use the following operating systems: Windows 7 (32 and 64 bit), Windows 8 (32 and 64 bit), Windows 8.1 (32 and 64 bit), Windows 10 (32 and 64 bit). What currency do I pay for the product in and what payment methods do you accept? Our product has prices in Euro, Dollars, British Pounds, Danish Krone and Swedish Krona, but you can pay with any type of currency and your bank will automatically convert your money into one of the 5 types of currencies mentioned above. Regarding payment methods, we currently accept the following: Maestro, Visa / Visa Electron, Mastercard, American Express, Paypal, Danish Dankort, Forbrugsforeningen, and JCB card. We protect users and companies from cyber-criminal actions, by keeping confidential information and intellectual property safe. As cyber-criminal attacks increased and data leakage became a major issue for every individual and every organization, there appeared a growing demand for a security solution to ensure that confidential information never leaks to a hacker controlled server. The Heimdal Security software was developed in 2011 by the 19th and 20th Team Defcon CTF World Champions in hacking. Heimdal is now used to protect organizations across Europe against advanced attacks, wherever their users may go. That's why our product has been created to address the real-world need for a solution against cyber-criminal actions and their malicious tools. For these reasons, we are recognized in the online community as fighters against hackers and their malicious actions. Hey! What do you say about this Easter Deal?